Former Shrewsbury Town manager Graham Turner says the spirit in Paul Hurst's League One table-topping team is comparable with his Division Three championship winning side of 1978-79. 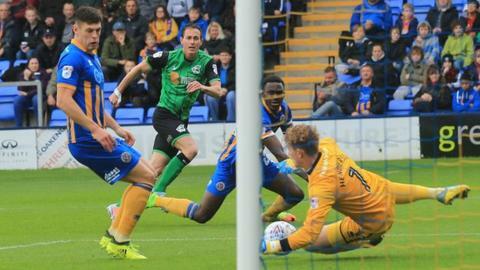 The Shropshire side remain the only unbeaten side in the EFL, having gone four points clear at the top after winning nine of their first 11 matches. "We had that same sense of team spirit in 1979," Turner told BBC Shropshire. "You always felt you were going to win, even if it took until injury time." Ahead of Town's perhaps biggest test yet - the away derby at Walsall on Saturday - Turner added: "I saw that with the current side last week when they went and won at Doncaster in the last minute." Turner, now 70, also believes that Hurst is equally adept at managing upwards and that the 'triangle' of power between Hurst, chief executive Brian Caldwell and long-serving chairman Roland Wycherley is a key factor. "Roland's always had the interests of the club at heart," said Turner. "He's never taken anything out. Just put in. He's been dogged in his ambitions to be successful. "And Brian Caldwell may have had a big part in bringing the new manager in. They seem to work very well together. "That triangle of people so important. If they can all get on, it's all further ingredients for success." After taking over from Wolves-bound Richie Barker in November 1978, Turner's side 41 years ago set the benchmark as far as the Shropshire club's history is concerned. They not only reached the second tier for the only time in their history but stayed at that level for 10 years. After moving on to Aston Villa, Wolverhampton Wanderers - where he twice won promotion - and Hereford United, where he enjoyed two more promotion successes, Turner enjoyed another promotion when he came back to Shrewsbury for a second time in 2010. He then exited football management for the final time when he left New Meadow in January 2014. But he has watched from afar with interest this season - and has been impressed. "Paul Hurst has got that natural enthusiasm that's needed in management," said Turner. "He was a good choice. His team are organised and motivated and have some more than capable players. "All the hard work he's put in is there for everybody to see. They now want the chance to compete with the Aston Villas and Wolves at this level. And Burton Albion are an example of what can be achieved. "What Burton have done, largely under Nigel Clough, gives confidence to all smaller clubs that they can go and compete at that level. "In the 1970s and 1980s, we were within spitting distance of getting into the top flight and I think that can be emulated again." Turner, who started in management at Shrewsbury in 1978 as player-manager, insists that 'a good dressing room' with the right leaders in it is another huge factor at any successful club. "You're only as good as the senior players in the dressing room. And we had the likes of Ken Mulhearn, our goalkeeper, and our skipper, Jake King. "I look at John Terry at Aston Villa now. He's so important to them. He will make sure the dressing room gels and is right. We had that in Jake King. He was our John Terry. "We had some good players, who went on to play at a good level. But the game was slightly different then. "There was more of a drinking culture about football, even at the top level. And I'm not sure the same amount of alcohol is drunk these days. "We'd have a few nights out, to cement that spirit of togetherness of having a few beers together. "But there'd be nobody shirking in training. If ever there was a problem words would be spoken by the players themselves."